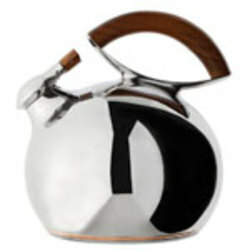 The wonderful Bulbo Kettle, created by award-winning designer Lou Henry, is an instant centerpiece for the style-savvy kitchenÃ¢â‚¬â€�every bit as sturdy and functional, as it is fabulous. The fanciful swell of the stainless steel body and the warm acacia handle and knob give it personality and flair while making it practical for everyday use. Best of all, the marvelous shape gives it a rare timelessness that makes it work with a full range of decor styles, from Old-world Tuscan kitchens to sleek, modern environments.